As the “official” holiday season rapidly approaches (for some early birds, it’s already here), prepare for a massive uptick in sales – but also for unique problems that come with the busy season. Let’s examine 5 conversion problems and what you can do about them. Peak shopping times spike sales but the additional load on your servers may slow down your site or crash it altogether. Even the largest ecommerce sites have crashed at the worst possible times, so no site can be over-prepared. Press your IT team to run traffic spike simulations, use a CDN (content delivery network) and leverage multiple servers. You can’t afford not to. Page load speed affects your conversion rate and even SEO, so don’t neglect to fix the “little things” that add up to big drags on site performance. Use Google’s Page Speed tool to grab an itemized and prioritized report that quantifies the seconds you’ll save by tuning your site. 1. Fix “leaks” in your PPC program early. Look for high spend, low converting keywords and adjust bids accordingly. Add appropriate negative keywords or even pause certain keywords for the holiday if they’re stealing budget from better targeted words. 2. Focus on landing pages. Landing pages now play an even larger role in Google’s Quality Score formula. This means low keyword relevance, high bounce rates and slow page loads cost you more per click, and naturally such pages convert less shoppers. Don’t just focus on filling your landing page with keywords, plaster value propositions for both your product and your business all over the landing page. Perform A/B testing on copy and design to reduce bounce rates, and apply the tips from Google Page Speed test to each landing page you tune. 3. Use remarketing. Regardless of what campaign your visitor came through or which page of your site he or she abandoned from, you can target visitors with remarketing. Remarketing allows you to show display or text ads that appear on other sites your abandoner visits around the web, including Facebook. Remarketing keeps your brand top-of-mind, and is especially helpful for new site visitors who may not remember exactly which sites they visited while comparison shopping. 4. Save carts for 30+ days. The holiday season spans November and December, so a long cookie window for holding cart contents is your best bet for recovering sales from abandoners who were simply deferring their purchase decision, or who were won back from Remarketing campaigns. 5. Salvage stockouts. If you choose to keep sold out items in your catalog, make sure you provide alternative product suggestions or offer an “email me when this item is back in stock” feature. Estimated re-stock dates are helpful during peak season, as shoppers don’t have too long to wait. Sometimes products sell out between the time the customer adds the product to the cart and is ready to check out. Staples notifies customers clearly in the cart and shows plenty of related items to save the sale. As popular items sell out, you want to make sure your paid search campaigns keep up so you’re not driving clicks to products you can’t sell. Also ensure your internal site search tool pushes sold out items to the bottom of search and category results when sorted by Relevancy. Amazon even allows shoppers to include or exclude OOS (out of stock) items in search and category results. Big FUD (fear, uncertainty and doubt) for holiday shoppers is “will it get here on time?” Make it very obvious where to find your shipping cut-off dates and delivery options, not just on your home page but product pages and shopping cart pages as well. 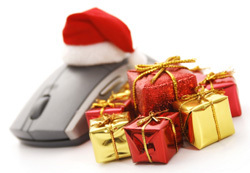 After the shipping cutoff date, promote offer e-certificates for last-minute shoppers. Shoppers know coupons and shipping offers abound on the ‘Net. When shown a coupon code box in checkout, many shoppers will leave your site, head to the search engine and snipe a code from an affiliate “deals” site. Not only does this reduce the purchase price, you likely pay a nice chunk to the affiliate that didn’t refer the sale (which also messes up your campaign attribution by overwriting cookies). One fix is to suppress coupon code boxes unless the customer has been referred by an affiliate or your own email campaign. (You may also choose to auto-apply the coupon only for such customers). A second solution is provide your own coupon codes on a URL from your own domain. This should rank highly in search engines for “your brand + coupon” and will save you those precious commission points. Macy’s does this nicely, but keep in mind, showing everyone your coupon codes means you’ll sell very little at full price. Finally, a third option is to make your coupon entry field very discreet — just a text link, rather than an open field which acts as a visual trigger to promote promo-seeking behavior. Text links to expand a coupon entry field is less noticeable, but those with a coupon code will look for it. The opposite of showrooming (visiting a store with intent to buy online), webrooming shoppers use your website to research purchases they intend to make offline (from your business or a competitor’s). Some webroomers use your site to research purchases from your business in-store. Ideally you employ excellent cross-channel tracking (for example, the customer is motivated to stay logged into an account to build and manage wishlists, and in-store purchases are always connected to a customer loyalty account). When this is not possible, over-communicate ship-to-store and reserve-and-collect service on product pages and in site headers. Consider treating interaction with your in-store inventory tool a micro-conversion, a signal of intent to buy from your physical channel. While you may not be able to track the in-store sale (including purchase total), you can add these visitors to a display remarketing campaign to keep your site top-of-mind (that hot item might be selling out everywhere in-store). These tips can be applied to any peak season your business may incur, so even if you find it too late to make some of these changes for this year, plan to put them in place and you’ll be prepared for the other spikes you enjoy over the next 12 months.